He might remind you of your old grandfather, or perhaps that rich guy in the televised series of Dallas. Make no mistake though. Doyle Brunson is a legend and one of the most successful poker players of all times. He started out playing poker in the small towns of Texas and went on winning nine world championship titles. And let’s not forget about all the other countless events that he has participated at. Most people know him by his name while others remember him as a promising basketball player. 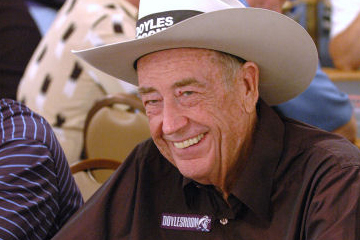 Doyle Brunson grew up in Longworth, Texas, and was drafted by the NBA’s Minneapolis Lakers. A knee injury stopped him from becoming a professional. The tragedy forced him into studies at the Simmons University in Abilene. While bills had to be paid, he began playing poker and picked up his skills by travelling back and forth from one university to another. After his graduation, he got a job, but quit when after it became apparent that his poker skills made him more money. Full Tilt Poker Bonus CodeHe moved to Texas in the 1960s and found his sweet spot, high stakes cash games. He joined many tournaments and performed very well, but it wasn’t until 1976 when he scored his first major world championship title. The following year, he won the championships with the exact same hand, 10-2. This later became the hand known as “a Doyle Brunson”. In 1978, Brunson released the poker bible of all times, Super/System, a complete guide to Texas Hold’em and other poker games. It is widely recognized as one of the most important poker books of all time, and a must read for anyone who takes poker seriously. His book has since then had some modifications, and a re-release is available, called Super/System 2. Despite age in the mid seventies, Doyle Brunson still plays poker at the highest possible level. Not only is he still a respected player (and a winner of numerous events in this century), but also a proud co-owner of Doyles Room, an online poker room on the internet. If you want to with play him, look for the most expensive cash tournaments in the world and you might be the lucky guy to spin his hat off. And good luck, because you’re going to need lots of it.